Victor Andrew de Bier Everleigh McLaglen (10 December 1886 – 7 November 1959) was a British-American film actor . He was known as a character actor, particularly in Westerns, and made seven films with John Ford and John Wayne. McLaglen won the Academy Award for Best Actor in 1935 for his role in The Informer. McLaglen claimed to have been born in Tunbridge Wells, Kent, though his birth certificate records Stepney in the East End of London as his true birthplace. His father, Andrew Charles Albert McClaglen, later a bishop of the Free Protestant Episcopal Church of England, moved the family to South Africa when McLaglen was a child. He had eight brothers and a sister. Four of his brothers also became actors: Arthur (18881972), an actor and sculptor, and Clifford (18921978), Cyril (18991987) and Kenneth (circa 1901-1979). Other siblings included Frederick (born circa 1882), Sydney (born circa 1884), Lewis (born circa 1889) and a sister, Lily (born circa 1893). 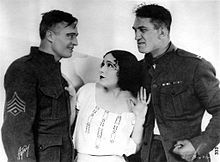 Another brother, Leopold McLaglen (1884-1951), who appeared in one film, gained notoriety prior to World War I as a showman and self-proclaimed world jujutsu champion, who authored a book on the subject. McLaglen left home at 14 to join the British Army with the intention of fighting in the Second Boer War. However, much to his chagrin, he was stationed at Windsor Castle in the Life Guards and was later forced to leave the army when his true age was discovered. Four years later, he moved to Winnipeg, Manitoba, Canada, where he became a local celebrity, earning a living as a wrestler and heavyweight boxer, with several notable wins in the ring. One of his most famous fights was against heavyweight champion Jack Johnson in a six-round exhibition bout. This was Johnson’s first bout since winning the heavyweight title from Tommy Burns. Between bouts, McLaglen toured with a circus, which offered $25 to anyone who could go three rounds with him. He also briefly served as a constable in the Winnipeg Police Force in 1907. He returned to Britain in 1913 and during the First World War served as a captain (acting) with the 10th Battalion, Middlesex Regiment. Later, he claimed to have served with the Royal Irish Fusiliers. He served for a time as military Assistant Provost Marshal for the city of Baghdad. He also continued boxing, and was named heavyweight champion of the British Army in 1918. After the war, he began taking roles in British silent films. Edmund Lowe, Dolores del Rio, and McLaglen in What Price Glory? McLaglen made the transition to sound films with ease, memorably starring opposite Boris Karloff‘s crazed religious fanatic in John Ford’s The Lost Patrol (1934), a picture about desperate soldiers gradually losing their minds fighting Arabs in the desert of what is now Iraq. Another highlight of his career was winning an Academy Award for Best Actor for his role in Ford’s The Informer (1935), based on a novel of the same name by Liam O’Flaherty. Frank Tashlin‘s 1938 cartoon Have You Got Any Castles? features a caricature of McLaglen emerging from the novel and literally informing someone about some shady characters. Arguably his most famous film apart from What Price Glory? remains Gunga Din (1939), with Cary Grant and Douglas Fairbanks, Jr., an adventure epic loosely based on Rudyard Kipling‘s poem that served as the template decades later for Indiana Jones and the Temple of Doom (1984). McLaglen was later nominated for another Oscar, this time for an Best Supporting Actor for his role opposite John Wayne in The Quiet Man (1952). He was especially popular with director John Ford, who frequently included McLaglen in his films, earlier as leading man, then later as comedy relief for films starring John Wayne. Toward the end of his career, McLaglen made several guest appearances on television, particularly in Western series such as Have Gun, Will Travel and Rawhide. The episodes in which McLaglen guest-starred were both directed by his son, Andrew V. McLaglen, who later became a film director who frequently directed John Wayne. In 1935, McLaglen spent a reported $40,000 to build his own stadium near Riverside Drive and Hyperion Avenue, near Griffith Park and the Atwater Village neighborhood of Los Angeles. The stadium was used for football and many other activities. The Los Angeles River flood of 1938 seriously damaged the stadium, and it fell into disuse thereafter. In 1941, he was selected as the grand marshal of the Clovis Rodeo parade in Clovis, California. Victor McLaglen was married three times. He first married Enid Lamont in 1919. The couple had one daughter, Sheila, and one son, Andrew. Andrew McLaglen was a television and film director who worked on several film projects with John Wayne. Andrew’s children, Mary and Josh McLaglen, are both film producers and directors. Sheila’s daughter, Gwyneth Horder-Payton, is a television director. Enid Lamont McLaglen died in 1942 as a result of a horse-riding accident. His second marriage was to Suzanne M. Brueggeman. That marriage lasted from 1943 until 1948. His third and final marriage was to Margaret Pumphrey, a Seattle socialite he married in 1948. They remained married until his death of a heart attack in 1959. He had by that time become a naturalized U.S. citizen. His cremated remains are interred at Forest Lawn Memorial Park, Glendale in the Garden of Memory, Columbarium of Eternal Light. On February 8, 1960, McLaglen received a star on the Hollywood Walk of Fame at 1735 Vine Street, for his contributions to the motion picture industry. 1928 Mother Machree Giant of Kilkenny (Terence O’Dowd), TheThe Giant of Kilkenny (Terence O’Dowd) With John Ford & John Wayne. 1928 Hangman’s House Citizen Denis Hogan With John Ford & John Wayne. 1929 Black Watch, TheThe Black Watch Capt. Donald Gordon King With John Ford & John Wayne. 1948 Fort Apache Sgt. Festus Mulcahy With John Ford & John Wayne. 1949 She Wore a Yellow Ribbon Top Sgt. Quincannon With John Ford & John Wayne. 1950 Rio Grande Sgt. Maj. Timothy Quincannon With John Ford & John Wayne.